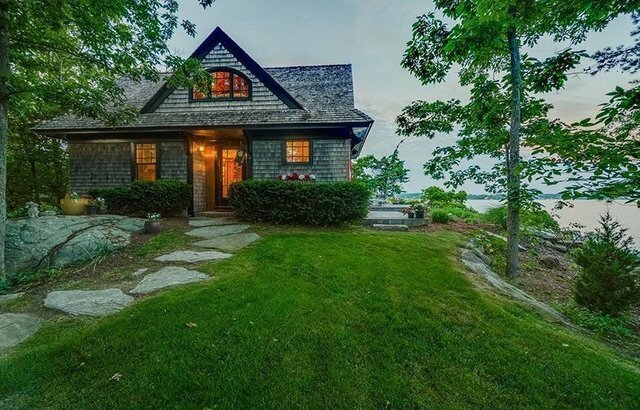 Expansion consideration up to three bedrooms.A private drive and quaint bridge connects you to a waterfront oasis nestled among the Thimble Islands with 360 water views. Bask in both sunrises and sunsets. 700 feet water frontage (+/-). Just 90 minutes from NYC and 15 miles to New Haven -- immerse yourself into an Island lifestyle. A seashore enclave of gentle sea-scented winds, mystical moorings, a pageantry of sunsets and sleepy tides of timelessness.Entertain in privacy by water's way or picnic in the tree canopied serene gardens. Guilford is a classic shoreline town with a charming, historic, village atmosphere, stone walls, natural beauty, and serene beaches.Guilford is now one of the prettiest and most dignified towns along the shoreline. Replete with boutique shopping, restaurants that offer a wide variety of cuisine, boating, beaches, hiking trails, antique shops, art galleries and historical home museums that display the town's heritage. Railroad service is available right in town.The picturesque nostalgic expansive "town green" is at the heart of Guilford. A benchmark in the elegant history of Connecticut, rich and full of life. Sale subject to cottage being subdivided to include in excess of one full acre. Subdivision process is almost complete.Arrangements can be made for usage of a dock during new dock application process. Taxes and assessment are not accurate. They will be determined at some point after subdivision. Flood insurance not required.